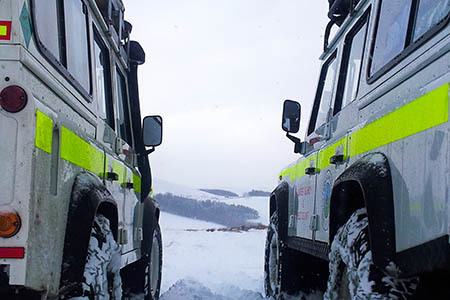 Two walkers were rescued from a hill high on the Scottish Borders in a night-time rescue involving volunteer teams from each side of the border. The pair, in their 60s, got lost in thick cloud near The Cheviot yesterday and called for help about 9pm after getting into difficulties. Border Search and Rescue Unit was called out to help find the walkers, who had become exhausted on the fells. A team spokesperson said the men set off from the Ingram Valley in Northumberland for a high-level walk in the Cheviots. “In dense clag and very limited visibility, they became disorientated and used a fence as a navigational handrail. Unfortunately it was a relatively new fence which wasn’t marked on their map, which served only to add to their confusion. “Several hours after dark they managed to pinpoint their position at a finger-post on Cairn Hill, just a few hundred metres west of Cheviot summit. The older walker’s long-standing medical condition, combined with the pair’s exhaustion, persuaded them to put in a 999 call to mountain rescue. “Teams were scrambled from Northumberland and from the Scottish side. A hasty team of five local BSARU members set off for the Auchope Hut and Cairn Hill from Sourhope at the top of the Bowmont Valley, with team-mates arriving from further afield making their way onto the border ridge at Windy Gyle in case the walkers had headed in that direction. “A small contingent remained in the control centre at Sourhope to coordinate the rescue and handle communications. “The poor visibility ruled out helicopter deployment, and an energetic march across sodden ground and steep snow was called for.